A better understanding of target audiences' mindsets can positively influence any marketing or sales initiative. 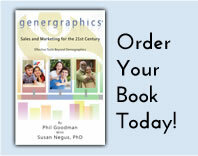 Genergraphics® services are a culmination of 18 years of research, case studies and analyses on how specific generations relate to commerce, as well as how they affect each other. Genergraphics services utillze a patent pending process of unmatched accountability to go beyond demographics, and even psychographics, to address the way we live and consume. It is simply a matter of helping you get to your target audiences and accomplishing your immediate and long-term objectives.